If you have ever met a house rabbit, you’ll know the importance of cordless things. This sweet night light is just $25 at Collected by LeeAnn Yare. 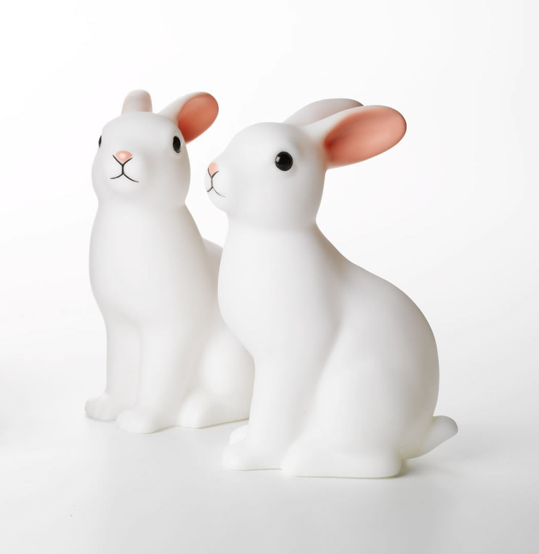 Love bunny things? Check out more editions of Monday Bunday here. Ikea has some great wire covers, we used them all the time. If you don’t have an ikea, take an old garden hose and cut the required length and slice it all the way to allow the cord to easily slip inside. Hi Eva, The hose is a great idea. We just hide all our cords behind heavy furniture or tape them up above bunny height now. No cords within reach. Guinea pigs too! Who would have thought electrical cords were so tasty . . . The bunnies look so cute and it’s cordless making it more convenient to use. Nice post.